Identification: Extremely variable. Forewing narrow. Upperside is black to dark orange-brown with yellow, red, and sometimes white spots. Underside with yellow and orange-red bands. Life history: Males perch or patrol all day for females. Eggs are laid in large groups on underside of leaves of host plants. Caterpillars feed together on leaves, flowers, or bracts in a silk nest. Third- and fourth-stage caterpillars hibernate under rocks or in litter. Caterpillars in high elevations can hibernate for several years. Flight: One flight; April-June in California and Oregon, June-July in the north and higher elevations. Several flights from April-October in western Arizona, southern Nevada, and the Mojave Desert. Caterpillar hosts: Besseya, penstemon, and Indian paintbrush (Scrophulariaceae); snowberry and honeysuckle (Caprifoliaceae); and plants from several other families including Boraginaceae and Rosaceae. Habitat: Sagebrush flats, chaparral, desert hills, high prairie, open forest, alpine tundra. Range: Alaska south along the Pacific Coast through California and Arizona to Baja California and Mexico; east to Montana, the Dakotas, Wyoming, Colorado, New Mexico. Conservation: Some subspecies and unnamed populations may require monitoring, management, or preservation. 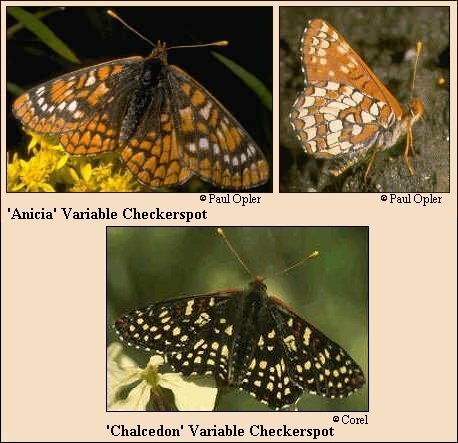 Note: This species is treated by some as three separate species Euphydryas anicia, E. chalcedona, and E. colon.